This afternoon the Cultural Resources Office uploaded the final agenda for next Mondays Preservation Board meeting. 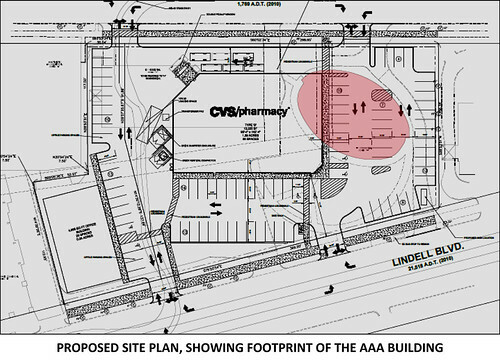 The agenda shows the proposed site plan proposed by CVS and AAA to replace the current AAA facility. 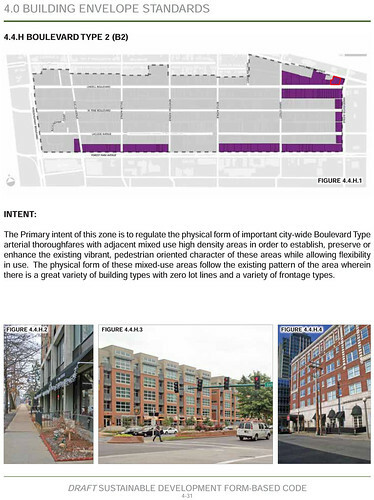 The graphic below (also from the agenda) shows the proposed CVS in relation to the existing AAA building. 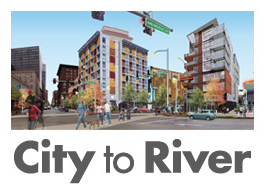 The site plan completely disregards the planned Central West End-Midtown Sustainable Form Based Zoning overlay district that has been in development for two years and is scheduled to be adopted as an ordinance this fall. Board Bill #79, which is enabling legislation that will allow the adoption of form based zoning overlay districts throughout the City of St. Louis was introduced by 17th Ward Alderman Joe Roddy on June 1st. The page above is from the Draft Regulating Plan of the planned overlay district. The area included in the overlay includes both sides of Lindell from Vandeventer to Kingshighway, and the three blocks south of Lindell to Forest Park Boulevard. The AAA site is outlined in red. While the plan is not yet law, some recent developments have taken the plan into account, including the mixed use 3949 Lindell building that has apartments over retail built right up to the sidewalk of Lindell Boulevard. I'm sure they would love to have AAA as a long term tenant in one of the remaining retail spaces since they seem to be unhappy with their present building. 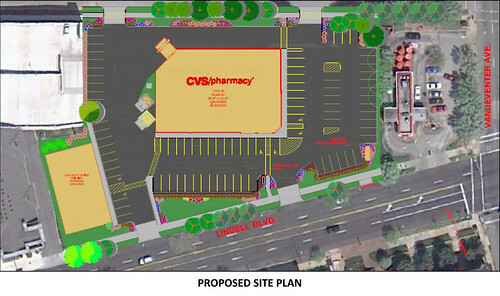 You may recall that the planned form based overlay plan was a factor in the downfall of the previous plan from CVS to demolish the former Housing Authority Building at Sarah to build a store. Please Attend Next Mondays Preservation Board Meeting! 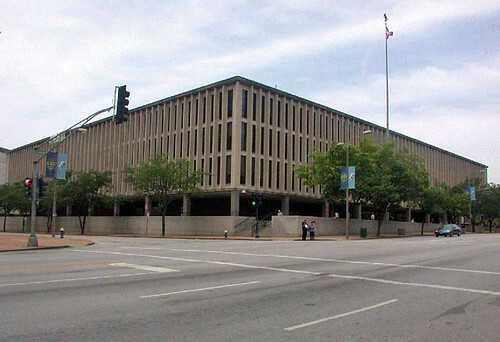 You have likely heard that the Preservation Board will consider the proposed demolition of the AAA building on Lindell next Monday. Your opinions and comments are needed! The developer of the proposed new CVS and adjoining strip retail center will no doubt argue that the AAA building is inefficient and outmoded for its use and must come down for the new building. 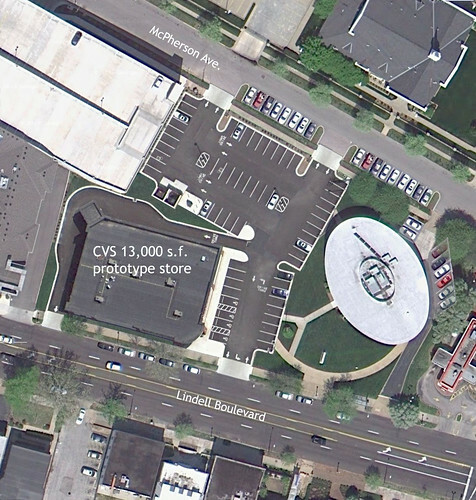 Contrary to this argument, a new prototypical CVS store complete with drive through can be accommodated on the western portion of the AAA site where the repair garage (which is no longer used) is located. 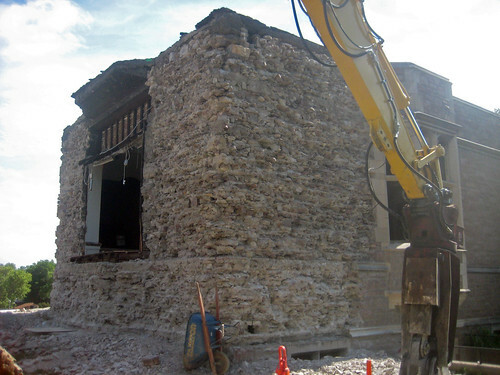 Demolition of the beautiful modern colonnaded AAA is completely unnecessary! We could hope that the architect for the new CVS could come up with something better than the standard beige fake stucco with some brick trim, but any plan that preserves the existing AAA building would be welcomed. What Should Be also posted an attractive alternative. You will also likely hear that "AAA no longer wants to be in their current building". Fine. They can move out any time they like and put their existing building up for sale or lease. 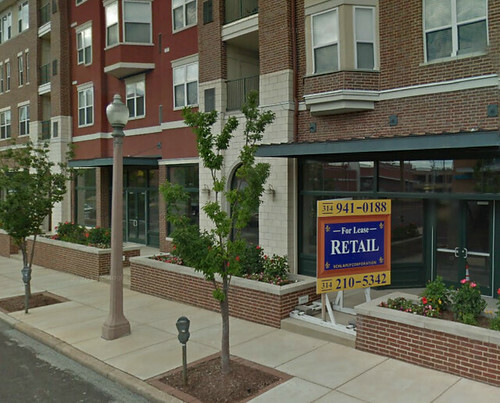 There are several retail spaces for lease in the adjacent 3949 Lindell mixed use development which was completed a few years ago that could accommodate the AAA office. There are also spaces available in the Lindell Marketplace center to the west and several other nearby buildings on Lindell. Additional new strip retail space is not needed on on Lindell. Landmarks Association has more information about the AAA's architect Wence Sarmiento, including an interview, on their News page. If 1520 Market Street sounds unfamiliar to you, it is the former Abrams Federal Building just west of the Peabody Opera House (photo above from Geo St. Louis). This is the building that Larry Rice attempted to buy several years ago to turn into a homeless warehouse. 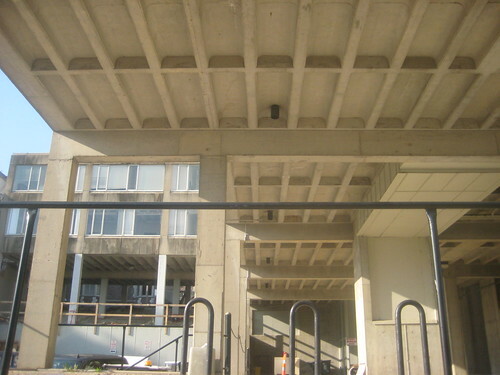 Eliot Hall, the remaining half of a pair of concrete brutalist style buildings completed in 1972 on Washington University's Danforth Campus is currently being demolished to make way for a pair of new buildings. 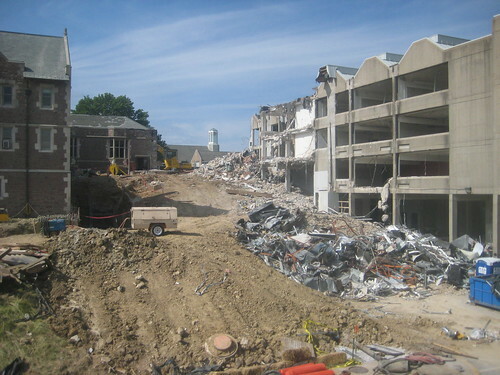 The demolition of a small connector to McMillan Hall began in mid-May, about a week before graduation. 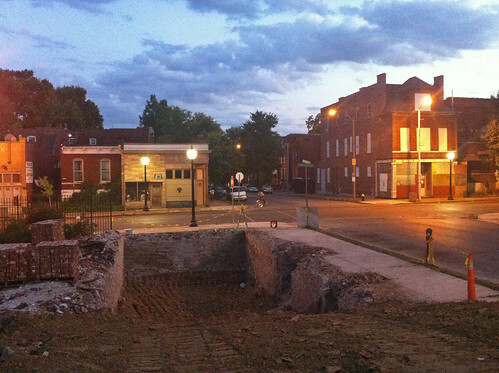 As of last weekend about a quarter of the structure had been demolished. Windows and interior partitions have been cleared from the north wing in preparation to bring down the structure. A view of the north wing of Eliot in mid-May. 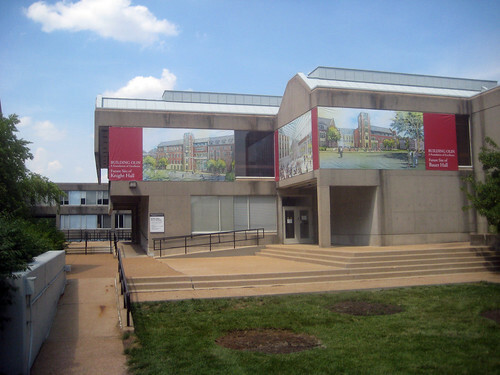 The building straddled the north face of the campus hill with two stories facing south to the center of campus and five stories cascading down the hill to the north. Much of the lower portion of the building had odd tall open spaces underneath which didn't seem to serve any purpose. Out with the "old", in with the "new". Just west of Eliot is the Charles F. Knight Executive Education & Conference Center, which will be expanded as part of the new construction. 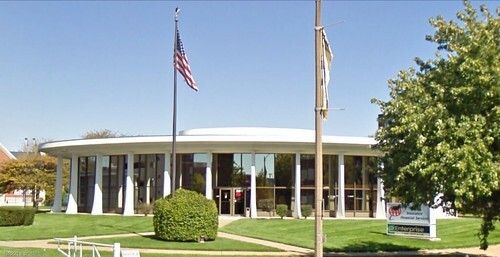 Mudd Hall, which was the other half of the 1972 complex had been demolished in 1998 for construction of the Knight Center. 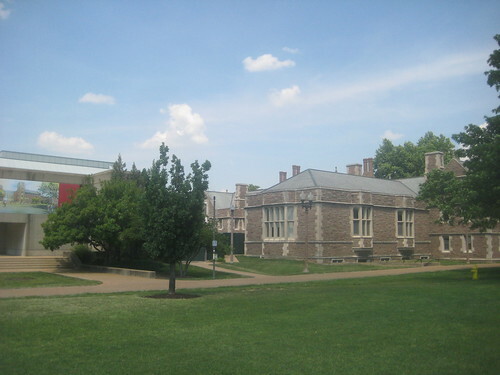 Information about Mudd, which had formerly housed the School of Law can be found in a recent issue of Washington University Law Magazine, which was dedicated to remembering the years in Mudd. 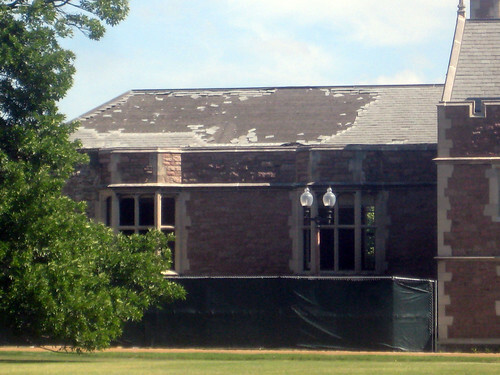 The architecture of the new Knight Hall will be similar to the existing building. 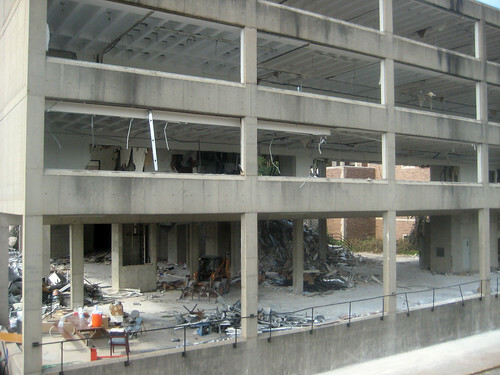 Across from the Knight building, as part of the project a portion of the Millbrook parking garage has been taken down to create a staging area for the construction of the new complex. After construction, the area will apparently be landscaped. 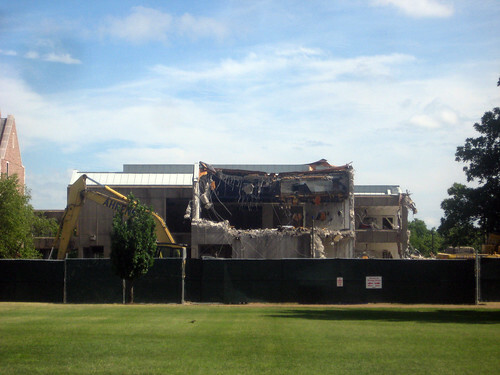 A view of the demolition from the center of campus and a the building prior to demolition below. 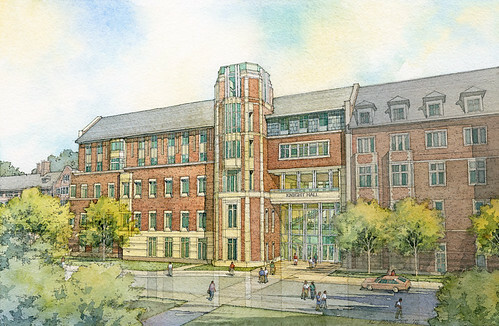 The rendering at right shows the south side of the new complex which will be named Bauer Hall, and house an expansion of the Olin School of Business. While peering through the fence last weekend I was shocked to see that not only is Eliot being demolished, but also a wing of the historic McMillin hall, which was originally a women's dormitory built in 1906. 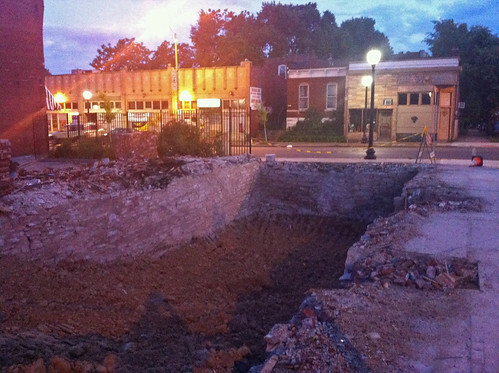 The one story wing that extended west of the main structure likely housed a lounge or other large public space in the building. Slate is being stripped from the wing, which will be cut back to a short bump-out with the a bay window re-created at the west wall. Below is a view of the wing prior to the start of demolition. 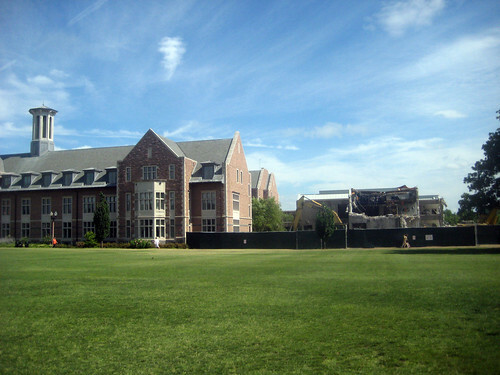 This photo shows the difference in scale between the existing Knight Center and Eliot Hall now under demolition. I should be clear that I am not mourning the loss of Eliot, but the west wing of McMillin is an unfortunate casualty. 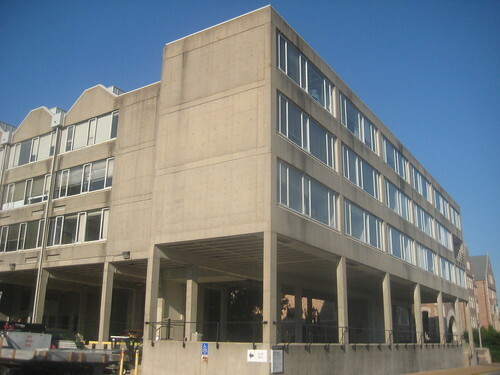 While I found some architectural elements of the building to be interesting, I understand that Eliot and Mudd Halls were hated by many and I also understand that the university has growth needs that must be met with additional square footage of buildings. Here is a good essay though from an architectural student titled In Defense of Eliot Hall. 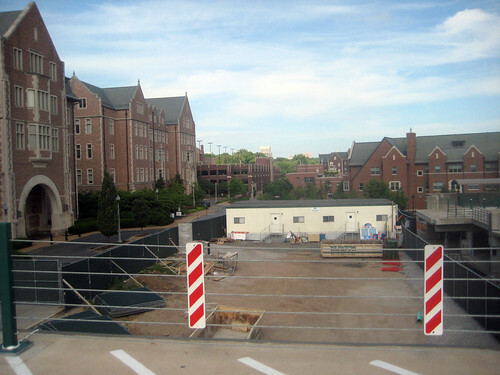 It should be noted that over the last 10-15 years that Washington University has built about a dozen large new buildings on its main campus without increasing its footprint by expanding classrooms into surrounding areas or the loss of a single private residential structure. Wash U instead has taken to urbanizing the hilltop as well as land east of Brookings, which is good. 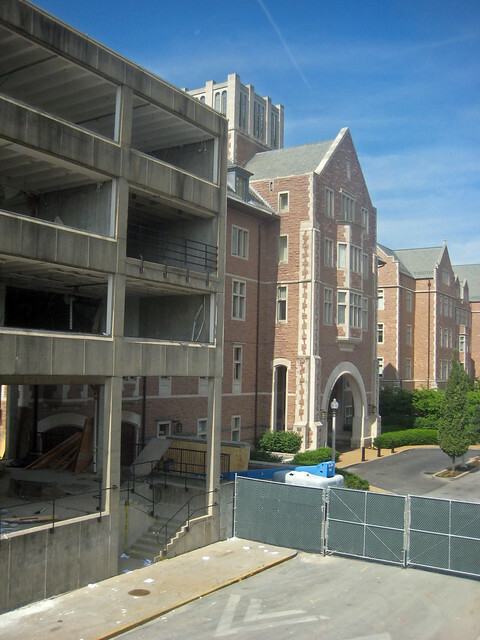 This cannot be said about another local university, who's demolition antics on and off campus have managed to keep preservationists in St. Louis in a constant frenzy.